Telford couple drawn to their perfect home! Dreams became reality when Angela Proctor and Richard Humpherson's walked into Oakford Grange hunting for their first home. Telford was the ideal location for the couple: good transport links with the West Midlands for Angela's job as a NVQ assessor and in close proximity to Richard's work in south Staffordshire. But as they entered the new Bovis Homes location they were still undecided about whether to go for a project or a new-build. Richard had sketched out their dream downstairs layout on the back of an envelope - and his drawing turned out to be exactly what they found when they were shown The Southwold house type at the Oakford Grange development. "He had literally drawn the layout of this house. It was unbelievable," says Angela. "We do like to entertain at home a lot and I didn't want a kitchen diner separate from the lounge area. I wanted it all to flow out into the back garden as well, because we do love al fresco dining; and that's exactly what we have here. People are really taken aback when they come through the door and they see how big and wide and spacious it is. We love it." Angela is full of praise for Bovis Homes sales advisor Tracy Groom and independent financial advisor Jay Foster who helped them through the buying process. "I really can't sing Tracy's praises enough," she says. "She knew that we were first-time buyers, and so did Jay, and they literally started from the beginning and explained it all. They made it so easy. It was brilliant. "It's not a massive development but it's big enough for you to go and have a walk around of an evening if you want to, and it's right next to some green space: there's a pool at the top of the road, and it's very quiet and well laid out. I love the way that the garages are at the back of the houses so you feel that you aren't going to have loads of cars around. Everything's neatly tucked away." After discussions with the Sales team and exploring their options, Richard and Angela used the Government's Help to Buy Equity scheme to get the home they'd set their hearts on. "It was just so easy because of the way they explained it," says Angela. "They didn't put any pressure on us. It was all done in a very advisory way and not as a hard sell. There was none of that. It was all very much about answering our questions and letting us decide what we wanted to do." With Help to Buy the customer is required to put down just a 5% deposit, with the Government contributing up to 20% of the cost of the property as an equity loan and the rest being met by the mortgage. There is no interest to pay on the equity loan for the first five years and it must be repaid after 25 years, or earlier if the home is sold. 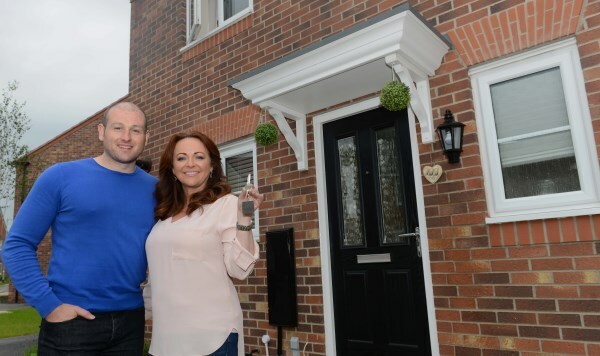 The icing on the cake was that the Bovis team pulled out all the stops to make sure that Angela and Richard could move into their new home in time for Angela's birthday. "Tracy knew it was my birthday and they got us in just beforehand," Angela says. "I was absolutely over the moon. Tracy and Roy the site manager made it really enjoyable. It was just seamless. I couldn't wait to get here and it felt like home right from the word go." For more information about Oakford Grange and all the Bovis Homes purchase assistance schemes, visit www.bovishomes.co.uk.